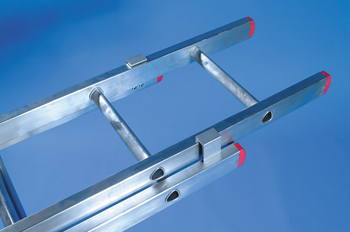 The ladders we stock carry the kite mark and are BS rated and classed as ‘domestic use’ ladders. Before you buy any ladder ensure it has a rating and do not compare ladders on price, compare them by weight. The more weight you are getting for your money generally indicates the better the ladder you are getting. Cerified to BS2037 Class 3. 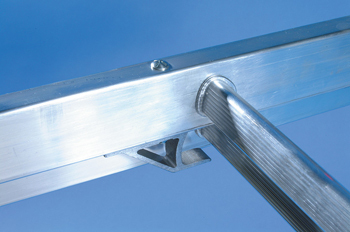 Rigid wide, box section stiles. Red, non-slip feet riveted in place. 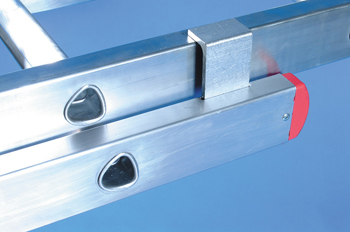 Extruded hooks and guides provide extra safety. Once you buy one of our there are a number of other products you might want to look at – stoppers, stand-offs, stabilizers of all sorts. 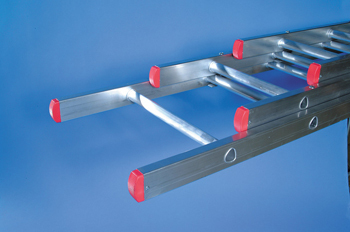 These items prevent ladder slip and twist and make the product safer in use.